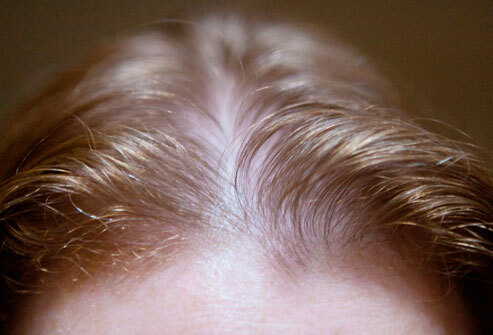 There is such a thing as “Female pattern baldness,” but not too many women want to talk about, or even acknowledge their thinning hair and balding. Because so many sufferers keep this problem under their caps, the beauty industry has been slow to find solutions. Women usually will only wear wigs and hair pieces or turn to prescription remedies as a last resort and in the case of extreme hair loss, but for those who have a mild to moderate hair shedding, which can be due to age, medications, hormone levels, genetics, and other health or lifestyle issues, fill-in powders may be a suitable option. 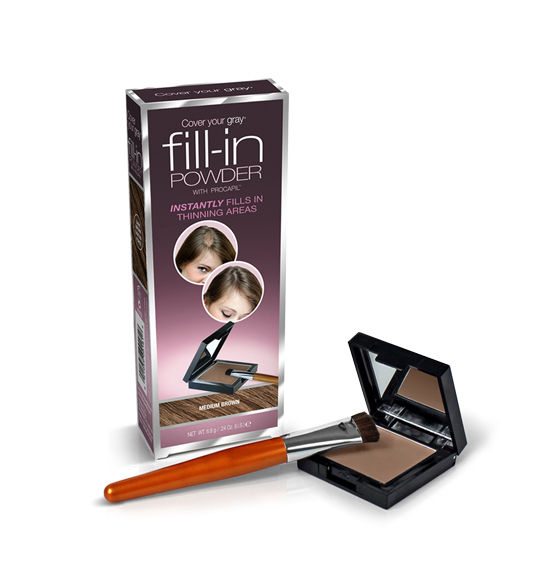 One product that works for many women is Fill-in Powder from Cover Your Gray. The matte powder can be dusted on with a brush to conceal thinning around the temples and cover graying or balding spots. Cover Your Gray’s formula contains Procapil, a natural botanical that promotes hair growth and prevents hair loss, so while camouflaging thinning areas it can help thicken hair and protect against further loss. The powder comes in four shades for matching, and it stays on through rain, sweat and normal daily activities. While many other similar cover-up hair products are designed for touching up hair color between highlights or color styling, they can also be used to cover thinning hair and boost volume, such as sprays to cover thinning spots; permanent or wash-out root touch up designed to cover grey close to the scalp; touch-up sticks for around the hairline, side burns and roots; and brush-in wants for broader cover-up for scattered gray hairs throughout the head. These are all affordable options, usually around $6 to $16. Look for brands that are waterproof, do not flake or rub off, and in shades that match as closely as possible to the rest of the hair, or slightly lighter. Powders and other topical solutions for thinning hair are generally the most efficient way to treat this beauty concern, and they are the safest and most economical, not to mention they can help extend time between salon visits.